A phrase that fits perfectly with the irresistible rise of International Women’s Day. The movement’s seeds were sown in 1908 when 15,000 women marched through New York demanding improved working conditions and the right to vote. This led to the Socialist Party of America declaring the date National Women’s Day. Two years later, at the International Conference of Working Women in Copenhagen, Clara Zetkin proposed that the day should become international. The 100 women present, representing 17 countries, agreed unanimously. From these humble beginnings, the movement has grown ferociously and now commands a global reach. 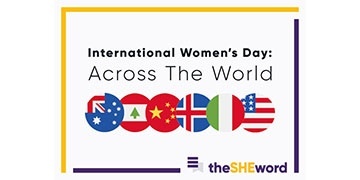 In fact, this article will highlight just some of the different ways in which countries and cultures across the world choose to celebrate International Women’s Day. No-one has ever celebrated International Women’s Day with the same level of style as Iceland did last year: 2017’s IWD saw the tiny nordic country introduce the Equal Pay Standard, a law that requires employers with more than 25 staff to ensure that they give equal pay for men and women. The hope is that the gender pay-gap will be eradicated by 2020. Last year saw women of the good ol’ US of A embark on a day of protest called ‘A Day Without a Woman’. This movement encouraged women to demonstrate the huge value that they bring to the workplace, by taking a strike-day off from paid labour – in order to show that they are no longer willing to receive lower wages, put up with discrimination, face harassment, or feel threatened by job insecurity. Meanwhile, ahead of IWD, the city of Melbourne installed female pedestrian crossing lights in a bid to reduce ‘unconscious bias’. Rather than mere symbolism, Letts believes that the change is “a practical and meaningful way to demonstrate that in fact 50% of our population is female”. Known as Festa Della Donna, International Women’s Day became a popular holiday in Italy following the end World War II. Traditionally, the mimosa flower has strong ties to Festa Della Donna – representing strength, sensibility and sensitivity. In more recent times, Italian women have used the day as an opportunity to protest issues such as violence against women. Last year, IWD celebrations saw all women granted free entry to the country’s museums. Dario Franceschini, the Italian Minister for Culture, declared that the decision was to announce International Women’s Day as “a day of celebration of exceptional women, whose fame has crossed the centuries thanks to art and culture”. In accordance with Chinese law, women are allowed a half-day off work on International Women’s Day. However, in spite of this, there are issues with women’s rights in China, which we would be foolish to ignore. 2015 saw the arrest of the “Feminist Five’ for handing out stickers about sexual harassment on public transport. Also, Sina Weibo — the country’s popular Twitter-like micro-blogging site — shut down the feminist blog Women’s Voices in the run-up to IWD, with no explanation given. Chinese feminist Li Maizi, one of the feminist five, was quoted saying that there “has been both progress and a backlash against women’s rights” since her arrest, as well as increasing state surveillance of NGOs. Want to know more about theSHEword? If so, go to theSHEword hub, check out our Twitter, or sign up to our email updates below in order to be the first to see theSHEword’s #IWD2018 content. To keep up with theSHEword campaign activities, head over to our theSHEword 2018 hub follow us on Twitter at @theEword or head over to our LinkedIn page. Gender Inclusion: What Why and How?